One of the worst aspects of smoking is nicotine. The highest poison rating that you can get is an S7, nicotine is an S6. It is extremely poisonous and the only reason that it does not kill you is that the heat of your body causes a molecular change. Nicotine has been used as a pesticide for a very long time. I have seen farmers soak the cured tobacco scraps in water for several days and then spray the water over crops as a pesticide, works like a charm. If you read the old gardening books from the 40’s and 50’s they tell you to take a can of water, put your cigarettes butts and a few cigarettes in, let it stew for a few days and then use it as a pesticide on the garden. Here is the problem for a person who smokes a cigarette. When nicotine enters the system your blood vessels very quickly constrict. This causes two things; it interferes with your blood circulation and you get a sudden rise in blood pressure which exposes you to stroke. Your skin is the biggest organ in your body and is fed by millions of capillaries. Every time you smoke a cigarette they close down and the skin does not get proper nutrition. This is why the average smoker looks older than a non-smoker. 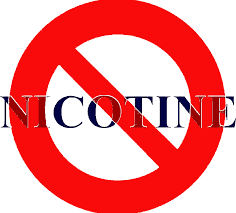 It makes sense to quit smoking just to not introduce nicotine into your system. Make the decision and stop smoking cigarettes and look forward to a life of health and vitality.